This is one of the perks of having a blog - joining contests and winning awesome prizes like the iPad Air that Globe and Nuffnang are giving away! If there is one thing you can give to the Philippines, what is that gift? Okay, I'm thinking about something like a lot of cash or someone like a better president. But it can be love or hope too. Just take your pick and give supporting details. After all, its going to be your piece. 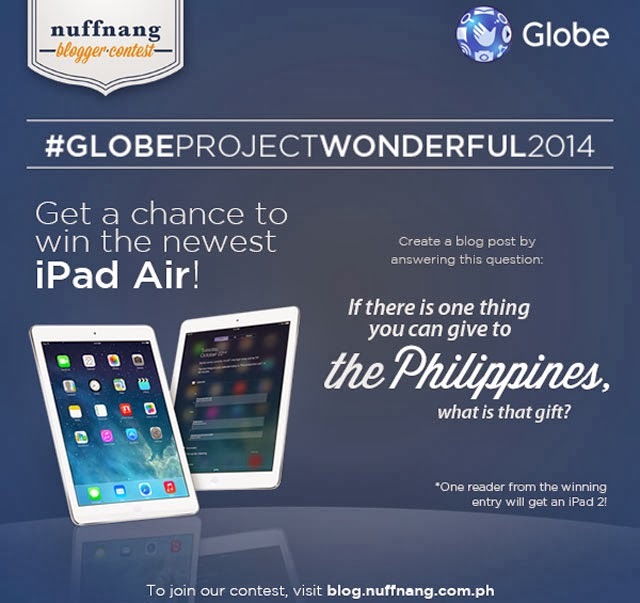 Since Globe is sponsoring the prize, you'll have to include the hashtag #GLOBEProjectWonderful2014 in your article. You can also check Globe's twitter account for more of their promos. Aside from the iPad Air that you will receive, the wish or gift that you specified in your article will be grated too! how cool is that? You might want to ask something tangible after all. It's actually not just you who will shine. The mechanics says you have to encourage readers to give their ideas too and one of them may also win an iPad2! Here's the full mechanics of the contest. Good luck! Make sure you submit your piece before January 29, 2014. Update: The contest is extended until February 15, 2014.
would be …. The gift of Health. ever, ever, bring the best of your health back, once it’s gone. families didn’t have enough money to buy basic medicines. ABOUT US — ALL OF US. My gift to the Philippines is saving our environment! by I will Plant more trees., Walk more, drive less.,Maitain my vehicle, I will Save water, Use CFC-free products, Save energy, I will Recycle and reuse, I will Recycle and reuse, I will Use renewable sources of energy, Save animals., I will Go green when gardening or farming,and Create Awareness! #GLOBEProjectWonderful2014. I want to give the gift of light to the Philippines. More specifically the gift of SOLAR POWER. As a victim of the super typhoon Yolanda, wherein we totally had no communication due to power outage for a while and even until now electricity has not been fully restored in many places that were in Yolanda’s path, having backup power coming from SOLAR Energy is truly indispensable. Too much chaos occurs in the dark at night when a lot of people cannot rest easy for fear of thieves and looters. Having light (literally!) in these dark and trying times is what we truly need. But I do also wish for every Filipino household, Yolanda victim or not, to have 100% sustainable hybrid homes and eco-friendly houses that combine rainwater harvesting and clean energy generation (THINK: UNLIMITED WATER SUPPLY & SOLAR POWERED HOUSES!). This way our electric bills and carbon footprints will be largely diminished as well as we can show our love for Mother Earth.